“Welcome to La Cava del Tequila!” I was among the first group of taste-testers for the 2009 Epcot International Food and Wine Festival’s inaugural Tequila Tasting Seminar today, and I wanted to bring you along with me. So, shall we to Mexico? The line was a little out of hand prior to the event, but sooner or later we were all checked off the list and seated in our assigned seats in the Cava. Epcot’s Tequila Ambassador, Hilda Castillo, expertly led us through an informative and interesting seminar. Hilda first described the background on Tequila, including its origin (Tequila, Mexico, where Hilda’s from), its source (Agave), its process, and its categories. 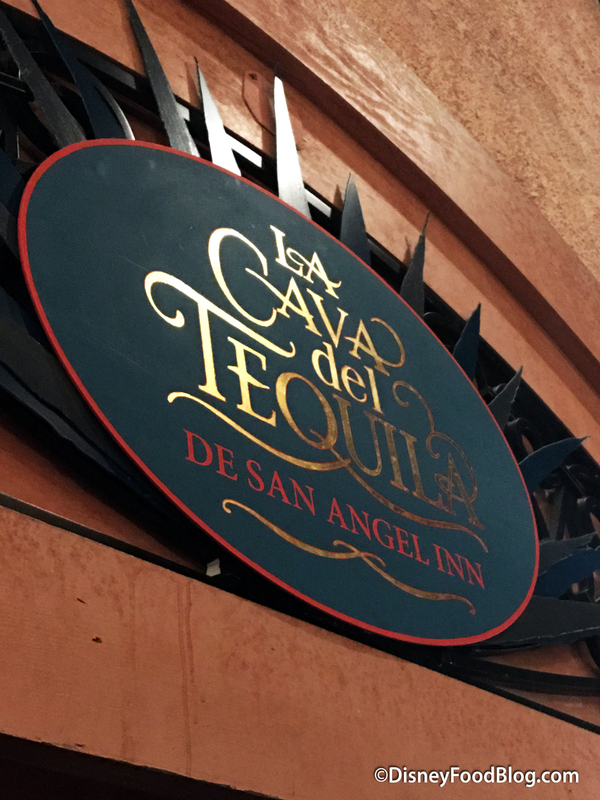 There is a brilliant mural on the side wall of the Cava that depicts the life cycle of Tequila processing, including the growth of the Agave plant, the cooking down of the plants to create Agave juice, the fermentation into Agave wine, and the distillation of the Agave wine into Tequila. From there, Hilda told us that we would be going through the tasting focusing on the following: Look (Sight), Aroma (Smell), and Flavor (Taste). She explained that different types of Tequila get their distinction based on the amount they’re aged. New Tequila, called “Blanco,” is very clear and very strong — think “gas fumes in your mouth,” because that’s what I tasted when we swished the Blanco Tequila! “Reposado,” or “rested” Tequila is a shade darker and significantly smoother than Blanco. Finally, the “Anejo,” or “aged” Tequila is a dark gold color and has a more “oil-like” consistency. This has the smoothest flavor of all. From there, Hilda led us through an aroma exercise. Because each type of Tequila had a specific aroma associated with it (lime with Blanco, cinnamon with Reposado, and coffee with Anejo), she had us smell a sample of the aroma before smelling each Tequila sample. Hilda showed us the three different ways to “perceive the aroma” of Tequila in order to gather the three different scents — sweet, alcohol-strong, and spicy/sweet — that are emitted. Finally, we got to taste. Hilda began with the strongest of the three and moved on to the richest of the three. The Blanco Tequila exploded in my mouth. We were supposed to swish for five seconds, and that was practically impossible. This alcohol was so strong my tongue went numb. The Reposado and Anejo went down much smoother, but based on my experience with the Blanco, I took MUCH smaller sips! Once finished with the Flavor segment of the event, we were served three small appetizer tapas — shrimp cocktail, a crab tostada, and a chicken tostada — to complement our Tequila. Overall, the event was lovely. Hilda is extremely knowledgeable and did a fantastic job as presenter, teacher, and adviser. I know that many of these are already sold out for the remainder of the festival, but if you get the chance, make a reservation (407-WDW-FEST). It’s a great experience! I’ve copied out the Epcot Tequila Bar menu here. Happy perusing! For more photos, links, and information from the 2009 Epcot International Food and Wine Festival, visit our Food and Wine Festival Page!